Kathleen M. Rodgers captures several life-changing events in Johnnie Come Lately with empathy, seriousness and humor. Her characters are well-defined; her plot is very credible and her use of schemes to further her story all combine to make this a completely entertaining read. I was captivated by Johnnie, Dale, Granny Opal (Johnnie’s grandmother), D.J., Cade, Callie Ann, and even Mr. Marvel. Brother Dog, the Kitchen’s faithful dog is interspersed within the story as a memorial to Kathleen Rodger’s Chocolate Lab, Bubba Dog. Then we are introduced to the furtive character of Johnnie’s mother, Victoria. This shadowy figure is very intriguing – what made her leave home? In her story lies the answers to so many of the other characters life choices. Compassion for the failings of the characters; alcoholism, bulimia, promiscuousness and several more are threaded throughout the story. The events and choices are enriched by Johnnie when she writes to the characters in her journal. This journal is Johnnie’s way of coping with her own deficiencies. To be able to treat such unpleasant situations with the understanding they deserve and then add believable humor to some of them takes a very talented writer and Kathleen is one of the small group of authors who can do it. As an example, the mental picture of an elderly man digging a hole in his yard for no apparent reason and then throwing a shovel in front of a fast moving vehicle for another “no apparent reason” is oddly humorous. Kathleen M. Rodgers’ first novel, The Final Salute, has been featured in USA-Today, The Associated Press, Military Times and many other publications. The novel soared to #1 on Amazon's Top Rated War Fiction in 2012, and the original paperback edition hit #2 on Amazon's Bestselling Military Aviation list in 2010. Deer Hawk Publications will reissue The Final Salute in both e-book and paperback in 2014. She is a recipient of a Distinguished Alumna Award from Tarrant County College/NE Campus 2014. Kathleen lives in Colleyville with her husband, Tom, a retired fighter pilot/ airline pilot and Denton, their shelter dog who adopted them after they lost Bubba Dog. She is the mother of two grown sons, one an award winning artist and the other a First Lieutenant in the US Army. 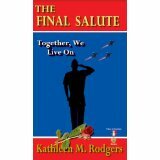 Kathleen Rodgers has crafted a true-to-life novel of Air Force life in The Final Salute. The characters are believable and the description of military life is real. I know what I am talking about because I grew up as the daughter of an Air Force officer. I “knew” many of the people, both military and dependant, described in this novel of military life of pilots and non pilots. Lt. Colonel Tucker Westerfield remembers the men he has known who died in the line of duty, both during war and peacetime. He has to deal with the fact that it could happen to him every time he goes on a mission – training or real. His wife, Gina, supports his need to be a pilot by keeping the “home fires burning” as she attends the obligatory parties and teas, protects their two sons from her own fears and goes about normal daily living on an Air Force base. In the course of this out of the ordinary novel, Tuck has to deal with the cover-up of an illicit affair by a ranking officer, a neighbor who has substituted her lack of children with animals, and a rebellious teenage daughter from an earlier short-lived marriage as well as the war in Kuwait. The characters have the same hopes and fears of civilians with the added burden of serving and protecting those same civilians. I recommend this novel as a good description of military life and the ‘inner workings’ of the way things are done, including the ‘cover-up’ process. Also, if you don’t read it for any other reason, read it or the enjoyment of it. Kathleen M. Rodgers is a native New Mexican who followed her husband from base to base as an Air Force pilot. She has two grown sons and a chocolate lab. She now lives in Colleyville, Texas with her husband and Bubba, the Lab. Her work has appeared in Family Circle Magazine, Air Force and Army Times, and Because I Fly, a poetry anthology published by McGraw Hill. Navigator Books recently released the Kindle edition with a new cover. Soft cover copies and the Kindle edition are available on amazon.com. The book won a Silver Medal from the Military Writers Society of America in 2009.